Some of FWMoA’s docents gathered for lunch and sightseeing at Joan Bovee’s picturesque Hickory Island Gallery. Photographed by Alyssa Dumire. Through our “Docent Dialogue” series we’ll learn a bit more about FWMoA’s greatest resources, the very special volunteers who make school tours possible—the Children’s Docents! They are the often-unsung heroes of the Children’s Education department and the roughly 7,000 students who tour the museum each year. All of our docents are multi-talented and come with a staggering range of career and life experiences, mostly outside the art world, which they’re happy to share with the children who visit the museum. Today we’re highlighting Joan Bovee, who is no exception. Joan is an artist (although she’ll tell you she’s not), gallery owner, educator, storyteller, farmer…the more I talk to her, the more the question seems to be, “What doesn’t she do? !” Each summer for the past few years, Joan has invited all the docents to her home and gallery for a relaxing and delicious home-cooked lunch. It’s a great chance for the group to spend some time together, agenda-free, as our meetings are nearly all business during the school year. I pulled Joan away from playing hostess to chat about her experiences as a docent and educator. 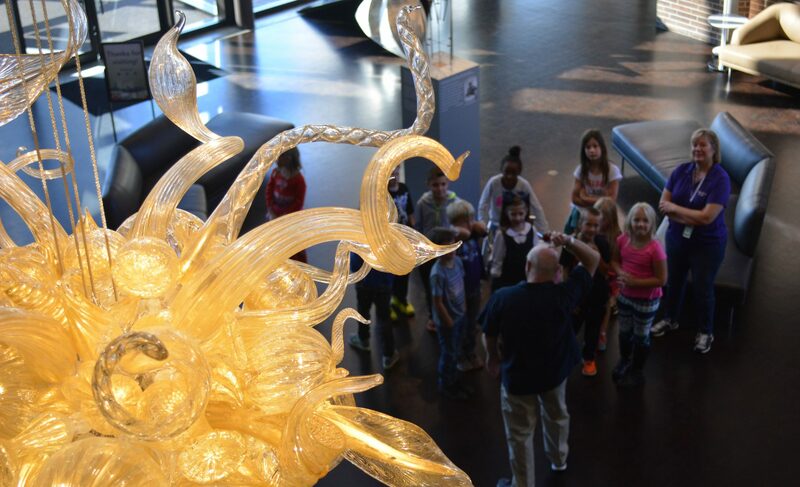 Docent Joan leads a discussion during a school tour of the 2017 Summer of Glass exhibition. Photographed by Katy Thompson. How long have you been a docent? How did you get involved with the program? Probably since 2007. I was involved with the museum through the Scholastic Awards for 20 or 25 years because the kids that are artistic and creative need a place to excel and to show off that’s not with a ball or a bat, or anything like that. And when I threatened to retire, Max [then Director of Children’s Education] said, “No, you can’t retire, you have to come be a docent!” And I said, “No, I don’t know enough to be a docent,” but he said, “You can do this!” So that is what I did. I taught at Prairie Heights Community Schools during the academic years, and during the summer I worked at IU and Ball State and had a lot of fun that way, teaching teacher education courses. I taught Home Economics [Family and Consumer Sciences today] at Prairie Heights and they kept saying “You’re an artist!” because I would do lots of elaborate serving pieces. My specialty at Christmas was candy, and I love marzipan because you can sculpt it and create it—it can be elves, it can be vegetables, it can be fruit, it can be anything. And then I would put it out and the kids would go “whoa!” and then I would show the kids how they can do that too. Do you have any memorable experiences on a tour? Is there anything a tour group has done that stands out in your memory? It was a high school group; I’m really impressed with high school groups that come. I’m pleased that we’re allowed to use cameras. During the Robert Williams exhibit, the sculpture of the Stamp Collector, the kids with their cell phones were standing as high as they could get taking pictures down into the book to see what kind of stamps were in the book and then we were identifying the country from which those stamps were from. I thought that was really interesting because those kids were so curious—that everything had a meaning and every piece of art tells a story. Another piece that I really liked was the tablecloth installation [Crystal Wagner’s “Spire”] where we went in and we sat and we listened to the plastic, and that was really neat to listen to plastic. Have you had a favorite exhibition over the years (besides those you mentioned) to take tours through? I have lots of favorites. Every kid that goes with me anyplace knows that you don’t have one favorite, you have lots of favorites, so I can’t say I have a favorite, but I lean toward the glass work, because I have done that and I know how it goes. People don’t think of glass as being art—they think of painting, and sculpting with clay, and that’s it. They don’t go beyond those realms of what art can be. The cut glass is interesting too. I have not done that, but I’ve watched it done and am fascinated. So…what occupies your time besides being a docent? [Sighs] All kinds of stuff. I try lots of things. I like to dabble in glass work, I like to work with kids, I do fiber things, I’ve done probably fifteen quilts for kids with their high school t-shirts…What else? We work with horses, I do lighted Christmas parades, lighted costumes…We started a Holiday parade at Shipshewana. That has now grown to the point that it’s phenomenal. We do the holiday parade at Hamilton, which has still retained that little country look to it and it is all electric, lit costumes and horses and things like that. I make apple butter, do demonstrations of apple butter. I’ve done that for 40 or 50 years. We have 300 acres—we raise soybeans; we raise corn; we have the orchard, which is not huge, that all the apples come from. We have the hay for the horses. That’s a continual battle to keep the hay going because there are six big draft horses to keep fed. I don’t find a lot of time to do things I like to do, but I try. If you let your mind stop, you get old. I learned that very easily when I was teaching because there were several senior teachers that had retired from Fort Wayne or Michigan who came back to our small community because we were a family and they had careers and were accomplished ladies, but they kept going. Dorothy lived to be 107. I learned from them that you never stop learning and you never stop giving. You try new things all the time, and the kids force me to try new things. If you could choose any artist to take a class with, who would it be? I don’t know enough artists to say I could pick one! I would like to work with a team that is led by Chihuly, but you have to be a gaffer and he probably has 30 gaffers working with him and he doesn’t do all the work! I would like to do cut glass too, but that’s not a single person operation. I like the socialness of getting together and doing things because one person has an idea, and then you do that, and it’s like wow, isn’t that cool! And then you have an idea, and it just builds. So because you are together with someone else and you listen to them, you are a much better creator because you’ve collaborated with them. It’s a collaborative effort.